Engineer – Richard Huredia*Engineer [Assistant] – Michelle ForbesKeyboards – Tommy Coster Jr. Recorded and mixed at The Mix Room, Encore Studios, Larrabee Sound Studios, Chung King, The Record Plant and 54 Sound. Track 15 contains elements from "The Bridge 2001" performed by Nas, Tragedy, MC Shan, Capone, Mobb Deep, Nature, Cormega & Millenium Thug. ℗© 2004 Aftermath Entertainment/Interscope Records. Track 4 contains interpolations of "Funkin Lesson" (G. Clinton, Jr., J. Hunter, W. Morrison, G. Shider). Vocal samples courtesy of Spectrasonics "Vocal Planet". Track 5 contains interpolations from "Toy Soldiers" (M. Dawson, M.J. Margules). Track 7 contains excerpts from "We Will Rock You" (B. May), performed by Queen. Track 13 contains interpolations from "U Can't Touch This" (R. James, A. Miller, K. Burrell). 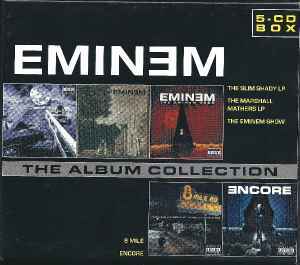 Also contains excerpts from "Just Lose Yourself" (M. Mathers, J. Bass, L. Resto) and lyrical excerpts from "Without Me" (M. Mathers, J. Bass, K. Bell, M. McLaren, A. Dudley, T. Horn). Track 15 contains interpolations from the composition "Self Seeking Man" (G. Write) [should be Gary Wright]. Track 17 contains excerpt from "Crazy On You" (A. Wilson, N. Wilson, R. Fisher), as performed by Heart. Remark: Track 5 is credited to M. Dawson. It's not clear why since the sample is written by Martika and M.J. Margules.